It is time that HR analytics start to show the value they deliver to the business. This is hard to do as it is still an emerging field. For this article, I have collected 15 of the best HR analytics case studies I’ve come across in the past two years. Each of these case studies are connected with a concrete business impact. For each case study, I will refer to their original publication. Quite a few case studies have come from the excellent Strategic Workforce Analytics report by Corporate Research Forum. This is one of the few papers that has collected case studies with business impact. Some of the others have been published on this medium before, and some others in newspapers. As I already said, I have only included case studies that showed tangible organizational benefits. On March 13 2015, the Wall Street Journal published an article titled: “The Algorithm That Tells the Boss Who Might Quit”. The article explored how Credit Suisse was able to predict who might quit the company. It was one of the first examples of the now very popular employee churn analytics. Not only were the analysts at Credit Suisse able to predict who might quit, but they also could identify why these people might quit. This information was provided anonymously to managers so they could reduce turnover risk factors and retain their people better. In addition, special managers were trained to retain the high performing employees who had a high flight risk. In total, this program saved Credit Suisse approximately $ 70,000,000 a year. The full article can be found here. Another great HR analytics case study of people analytics at work was published in the Harvard Business Review. In an article titled Competing on Talent Analytics, the authors describe their research in multiple large companies in the US. They specifically researched the relationship between engagement and financial performance. Engagement is often seen as the holy grail of HR – but its impact is hard to measure. The authors describe that some organizations “can precisely identify the value of a 0.1% increase in engagement among employees in a particular store.” They take the example of Best Buy, where a 0.1% increase in engagement results in over $ 100,000 in annual operating income per store. The significance of this relationship motivated Best Buy to make employee engagement surveys quarterly rather than annually. The full article can be found here. Employee attrition at Experian was a problem. The company was facing levels of turnover that were 3-4% higher than they wanted it to be. By building a predictive model that included 200 attributes, including team size and structure, supervisor performance, and length of commute, they were able to predict flight risk. An example risk factor was teams of more than 10 to 12 people. The analytics team also identified flight risk triggers: when someone moved further away from the office, this would increase immediate flight risk. The model was rolled out in multiple regions – with slight differences to the predictive algorithm. These insights, combined with good management practices, reportedly resulted in a drop in attrition of 2-3% over the past 18 months with an estimated saving of $8,000,000 to $10,000,000. A similar analysis was done at IBM, where turnover was high for certain business-critical roles. Using IBM’s Watson machine learning capabilities, the workforce analytics team build an algorithm that included sources like recruitment data, tenure, promotion history, performance, role, salary, location, job role, and more. The company also included employee sentiment, measured through their Social Pulse. The hypothesis here was that engagement with social media might fall when employees are thinking about leaving. The investment yielded $ 300,000,000 over four years and turnover for critical roles has fallen by 25%. According to the report, productivity has also improved while recruitment cost have fallen. Nielsen created a similar predictive model back in 2015. The first predictive model only included 20 variables, including age, gender, tenure, and manager rating. Over time, more variables were added. This exercise provided multiple insights, including that the first year mattered the most. First-year employees where checked whether they’ve had their critical contact points. For example, the first check-in with their manager had to happen within a certain time span after hiring, otherwise, it would trigger a notification. This was a proven, important condition for first-year retention. Although getting promoted pushed people to stay, lateral moves were also a strong motivator for people to stay. A significant outcome was that the people with the highest flight risk in the next six months were approached and the company was able to move 40% to a new role. Making these lateral moves increased an associate’s chance of staying with the company by 48%. A fantastic study on the impact of good hiring assessments took place in Zimbabwe. A local transport business wanted to reduce the cost of road traffic accidents (RTA) of their drivers. This not posed a danger to the people involved but these accidents also delayed the transport and were very costly because of material damages. A local consultancy researched if psychometric tests could predict if some people had a higher likelihood to be involved in a traffic accident than other. If these factors could be identified, they could be used as selection criteria for new hires. They discovered a number of very useful insights. First of all, it turned out that a popular Defensive Driving Certificate (DDC) that drivers had to get, had no impact on their likelihood to be involved in an accident. Measured levels of concentration and Reactive Stress Tolerance (RST) were related to accident proneness, as well as the number of years a driver had their driver’s license. Assessing a driver’s baseline concentration and RST before hiring them made sense. So did hiring older drivers as they were more experienced. The full details of this HR analytics case study and the statistical tests can be found here. Another interesting HR analytics case study was about reaching optimum staffing levels. A large mining company in Zimbabwe was concerned about losing money because of over or understaffed departments. The experts took an interesting approach in analyzing under and overstaffing. They took the number of employees of a business unit and compared this to the business activity of this same business unit, measured over 17 quarters. The relationship between the number of employees and business activity was strong with an R squared of 70.34%. This means that 70.34% of the business activity could be explained by the number of employees. By plotting these two dimensions, the team was able to identify the departments that were overstaffed and understaffed. Excess employees were retrenched. It turned out that the breakeven point of retrenchment costs was only two months – in month three, the company was already saving money. Retrenched employees could also be relocated to similar roles in understaffed departments. Click the link for the full people analytics case study. A brief case studie is presented in an article written by Tony Brugman and Rob van Dijk from their own consulting work. People analytics also helped E.ON tackle employee absence. Absenteeism in this German 43,000 + people energy company has risen above benchmark. The analytics team formulated 55 hypotheses, tested 21 of them and validated 11. One of the examples written in the report was that selling back untaken holiday did not increase absenteeism. What did increase absence was a lack of a long holiday somewhere during the year, or not taking a day or two once in a while during the year. This insight was communicated to managers to improve holiday approval policies. Shoe retailer Clarks looked into the relationship between engagement and financial performance. The first question they asked was: is there a connection at all? Because the company already reported higher-than-average levels of engagement, it looked into the returns of engagement and whether the returns of engagement would diminish with higher levels. The team worked with statisticians who ran the retailer’s distribution planning system. In total, 450 business performance data points were included in the analysis. According to the report, the results showed that there was indeed a connection. Engagement leads to higher business performance. In Clarks’ case, every 1% (percentage point) improvement in engagement, lead to an improvement of 0.4% (percentage point) in business performance. To learn from this and to make it more actionable, the team also analyzed the characteristics of the 100 best performing stores, both quantitatively and qualitatively. They found that there was an optimum team size in the store and that the length of tenure of a store manager was a significant predictor of performance. This meant that switching store managers frequently lead to lower performance. With these insights, the team was able to create a blueprint for high-performing stores. In addition, they created an engagement toolkit that managers can use to improve performance. A similar result was found at Shell, where engagement was linked to superior business performance, through improved safety practices. A 1% increase in employee engagement resulted in a 4% drop of ‘recordable case frequency’, a key industry safety standard. Safety performance was in turn directly related to business performance. Another great people analytics case study took place in a large restaurant chain that was in a downward spiral. The management team didn’t understand why. They had pieces of information but struggled to implement effective policies. A team of consultants was asked to investigate and provide insight through data. Business performance would increase if these three metrics would go up. By mapping these factors on their own scores and the impact they have on the business outcomes, the team could easily visualize which drivers contributed most to business performance – and which drivers front-line managers should focus on. The six factors that would receive the most attention are in the blue square. By focusing on these 6 factors, line-managers would create the largest return. In a second people analytics case study, Clarks applied compensation and benefits analysis to optimize rewards packages for employees. Satisfaction could be improved by up to 15 percentage points by giving people a small amount of money to invest in their own development. Employees also wanted to be able to sell their holiday days – which actually saved the company money. A lot of these HR analytics case studies have focused on leveraging internal data. In the same report, we can find an analysis in which external data plays a big role. Cisco has used demographic data to identify where they can best open up new offices. By combining various data, including current usage rates of office space, cost and availability of key talent, and availability of graduates from universities allowed them to expand in areas where there were fewer larger players competing for the same talent. In addition, when selecting a new office, Cisco made use of this same data to find locations where employees with relevant qualifications were available and abundant. When Kraft Heinz launched a hostile takeover bid in early 2017, Unilever’s workforce analytics team showed that analytics could also be deployed in times of crisis. The team analyzed networks in the organization, and create models to come up with potential cost reductions. In addition, the team was able to track the employees’ moods and attitudes. This enabled them to see how employees were reacting to Unilever’s defence strategies. These insights directly helped decision making during the crisis. In this article, we’ve discussed 15 HR analytics case studies. I’m sure there are more out there. If you know of a good one, please leave a comment below the original article. Erik van Vulpen is an expert in connecting HR processes to business results through qualitative and quantitative methods. He is globally recognized as a thought leader in the Digital HR space. 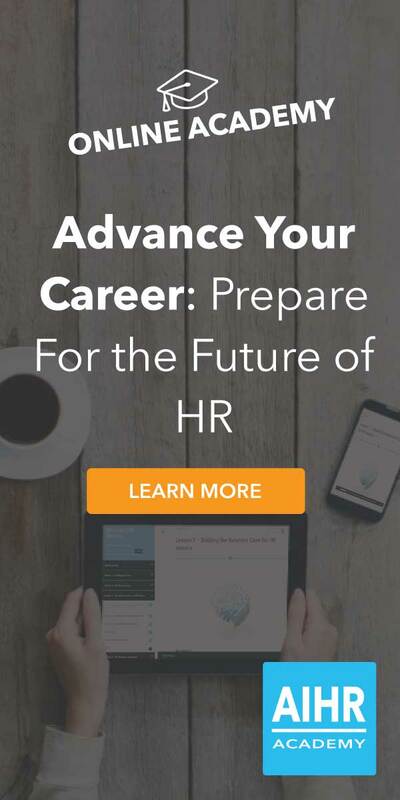 Erik is a regular speaker at conferences and trained dozens of HR leadership teams to embed innovative and data-driven HR practices in their organization. He is also an instructor for the AIHR Academy, as well as one of its founders. Connect with Erik on LinkedIn.